As the Great Western Mainline cuts through the Berkshire countryside, there are regular level crossings along the way. Usually unmanned, they are still common where a minor road crosses a railway line - even a busy one. This accident is a deadly example of what can happen when a car ends up on a high-speed railway line. The driver of the train would have had just seconds to stop - nowhere near enough time. He had no automatic warning of the car ahead on the line. Only if the barrier had been open would red signals have been triggered to slow and stop the express from its speed of 100 miles an hour. The significance of this crash is clear from the fact that it is the first time in nearly 20 years that train passengers have died in a level crossing accident. It is generally car drivers who are killed in such incidents. Yet a few months ago, the head of Britain's railway inspectorate, Dr Alan Sefton, said level crossings were the "greatest potential risk" to the safety of the railways. Eighteen people were killed, on foot or behind the wheel, at rail crossings last year. Some have single barriers that block only half of the road in each direction. This is intentional - it allows drivers who have ended up on the track by accident to get to safety. But it does mean it is almost impossible to stop a driver who may be intent on taking the risk. A car can be simply driven around the barriers onto the track. One local resident emailed the BBC to say some drivers would do this at Ufton Nervet, if they could see there was no train coming. 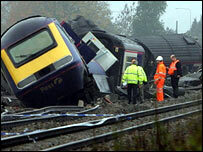 Following the Berkshire tragedy, rail trade unions have called for level crossings to be removed from high-speed lines. That would be extremely expensive. And the rail industry would regard it as an over-reaction. The truth is that most accidents like this one are caused by car drivers. Rail chiefs believe what is needed most of all is a campaign to educate them of the risks.